Alexis Koefoed holds different varieties of eggs. Sorry Sam I Am, hip eggs these days aren't just green. No longer a simple matter of brown vs. white, eggs are going gourmet. So how about some blue eggs with that ham? Or perhaps an ostrich omelet? Quail quiche? Maybe you yearn for something "pastured," as in the eggs of hens that roamed free as a, well, bird. "It's been really good what's been happening with eggs," says Mourad Lahlou, who as chef at San Francisco's Aziza restaurant has seen eggs rise in the pecking order from bit player to dining scene star. "They're so nutritious. They're so good for you. They're so delicious," he says. "I've been feeling the last year or so especially that more and more people are using eggs." Alexis Koefoed became part of the egg revolution a few years back when she moved with her family to Vacaville, about 50 miles east of San Francisco, and started Soul Food Farm. There she's raising "pastured poultry," allowing her hens to strut, scratch and grub their way across fields of pasture. This kind of farm used to be the only way to go. But over time, egg production moved indoors, where controlled conditions create greater efficiency and a cheaper product. The renewed interested in fresh and local food of the last decade or so has spurred a counter-trend with organic and free-range eggs becoming more common, along with "designer" eggs touting various health claims. Meanwhile, other species have been showing up, with quail and duck on restaurant menus and available in some specialty markets. And lesser-known chicken breeds are re-emerging, such as the Araucanas that lay eggs with shells of a blueish-green hue. Americans may be getting more adventurous with eggs, but they're eating fewer than before. Last year, the typical person ate 255 eggs, more than a decade ago when it dipped to 234, but down from the more than 300 in 1970, according to federal data. And conventionally farmed chicken eggs dominate. The USDA doesn't have figures on pastured poultry or non-chicken species but estimates there are about 2.2 million certified organic hens laying eggs, accounting for just over 1 percent of the consumer market. But interest in the gourmet side of the egg world is growing. Sales of organic eggs were up 18 percent to $190 million from 2005 to 2006, according to the Organic Trade Association. The pastured method aims to keep hens outside all day, Koefoed said. But that labor-intensive method comes at a price. Soul Food Farm eggs cost $5 a dozen at the farm, about $1 more than the national average for organic eggs. 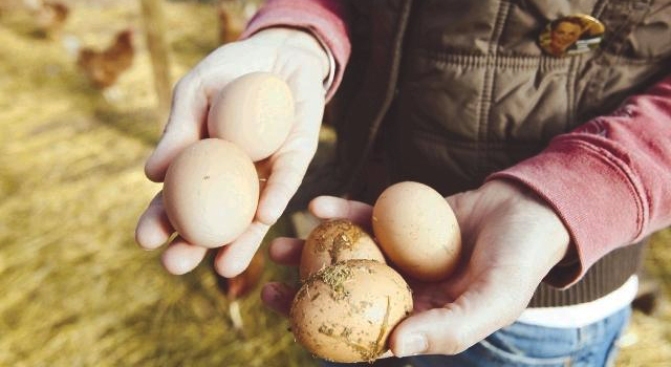 Fans of pastured eggs say they're worth it. The yolks are "like a golf ball and the color is so intensely orange. It's just a concentration of flavor," says Chef Lahlou, who often serves pastured eggs. If the egg in question is from an Araucana, he makes sure to send out the shell on the side. "When people see that it's blue, they really don't believe it." Gayle Pirie and John Clark, authors of the cookbook "Country Egg, City Egg," are pleased to see eggs breaking into the culinary big time. "As far as we're concerned they've been hot for a long time," says Pirie. "They're a perfect protein food. They're a perfect energy food. We've loved them because they're a quick easy meal." The two, chefs at San Francisco's Foreign Cinema restaurant, regularly feature egg dishes, playing with rustic and sophisticated takes. One of Pirie's more extravagant offerings is a poached, breaded and fried egg. Duck eggs, a sweeter and richer taste, they might serve with porcini. Quail eggs — "They're adorable." — make a nice garnish on tiny toast. Interest in raising hens on pasture has picked up in the past 10 years, says Jody Padgham of the American Pastured Poultry Producers Association. The group now has about 500 members scattered across almost all 50 states. "What we're doing is creating a unique product and in a unique way," says Padgham, who farms near Eau Claire, Wis. "You're not going to get rich, but it's very satisfying and the product is very well-received in the marketplace." "The most significant thing to me is that we're doing the right thing for the animals," she said, "and because of that the food quality is so high, the meat's delicious and tastes great. The eggs are wonderful." Perhaps this is what all those chickens were crossing the road for.